In a recent comment session with fellow photographer Wil C. Fry, we talked about an image I made in 2006 at Muley Point, Utah. My wife Abby and I were taking a driving tour loop south from Monticello, Utah, through Cedar Mesa, past Muley Point, down the Moki Dugway, and through Valley of the Gods. It was a beautifully bright, clear day. Abby and I both shot well. Or so we thought. 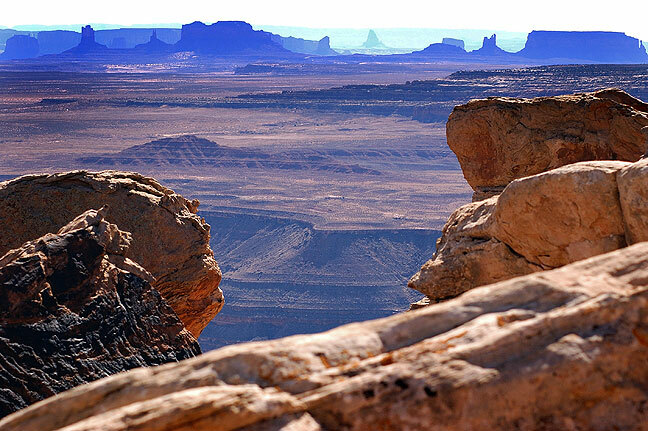 One of the things we saw and photographed at Muley Point was Monument Valley, about 30 miles south. Despite the sunshine, there was a considerable amount of haze in the distance, and since haze scatters blue light, the spires of Monument Valley looked very blue. But overall, the image expressed the tone of the day, and the impressive distance views of the desert. This is one of the exposures I made at Muley Point, Utah, in 2006. The tonal quality is very much as I had pictured it, and correctly reflects the brightness values of the scene. The noticeably blue haze in the distance seemed to distract me (particularly with my black-and-white, haze-cutting-filter roots), so I decided to ask a web forum, photo.net, for suggestions. Maybe someone there had a similar problem and found a solution, possibly in the form of an Adobe Photoshop action. I removed my image as soon as I read that, because that kind of comment is the way the internet community rolls: one-dimensional, judgmental, completely ill-informed blanket condemnations. Some part of me thinks I should have called the guy out: your weren’t there, you didn’t shoot this, you don’t know how it looked, and you had no way of knowing what I wanted. But I knew better. No one on the internet ever backs down and thanks you for setting them straight. They usually just call you names. My takeaway from this is that it is usually a waste of valuable time, energy and creative thought to attempt to get much more than basic advice from web forums and social media. Better advice is to follow your heart, your creative spirit, and your instincts. The internet is not the place for greatness. Generally, instead of “calling someone out”, I tend to either (a) ignore such comments, or (b) respond in such a polite, questioning way that everyone else sees them for the jerk they are. But yeah, it’s taught me to not ask such questions in most photography forums. There are (have been) plenty of nice, knowledgeable people, but just enough of the assholes to ruin it for everyone.